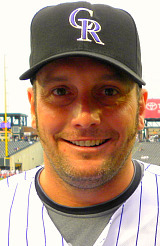 According to Troy Renck of the Denver Post, the Mets have signed veteran starter Josh Fogg to a minor-league deal. Considering the Mets’ multiple question marks throughout the pitching staff, I see this as a smart, shrewd signing. In essence, Fogg is a healthier version of Tim Redding, but who also has better potential than Redding as a relief pitcher. Ironically, Redding has signed with Fogg’s 2009 club — the Colorado Rockies. By no means is Fogg the answer to the Mets’ problems in the starting rotation. At his best, he’s a .500 pitcher on a strong offensive club, and someone who rarely pitches far past the fifth inning. He’s very hittable and walks too many batters for someone who is so hittable (though, by Mets’ standards, he’s a “control pitcher”). However, he posted an excellent 1.13 WHIP in 2009 — the best of his career — pitching almost exclusively out of the bullpen. Though the Mets might see him as depth / insurance at the back end of the rotation, I would pencil him in, right now, as their top setup man — mainly because he less of a health risk than Kelvim Escobar, and has shown more MLB success than Bobby Parnell and Ryota Igarashi. Wow. So that’s how low the Mets have fallen — to the point where Josh Fogg could be their best setup man.